There have been many important births since the dawn of humanity. Consider the births of the scientists who have given us things that make life easier. There have been researchers who have discovered treatments and cures for diseases and ailments. Great humanitarians who, through their tireless efforts, have eased the pain of many and helped them live productive lives. The births of those who grew up to be preachers and missionaries have blessed those to whom they have ministered. However, one birth stands far above the rest. It is the most important birth there ever was or ever will be. It is the birth of Jesus Christ. Jesus’ coming in flesh as a man is called the ‘incarnation’, a word that means ‘in the flesh’. The clear record of the Bible tells us that Jesus is God in human form. First, we must remember that Jesus existed prior to His incarnation, “In the beginning was the Word, and the Word was with God, and the Word was God. He was in the beginning with God. All things were made through him, and without him was not any thing made that was made…And the Word became flesh and dwelt among us” (John 1:1-3, 14 ESV, cf. Colossians 1:15-17). In one of Jesus’ prayers, He prays, “And now, Father, glorify me in your own presence with the glory that I had with you before the world existed” (John 17:5 ESV). Clearly, Jesus did not begin His existence when He appeared as a baby in a manger in Bethlehem. He had already existed from eternity past. 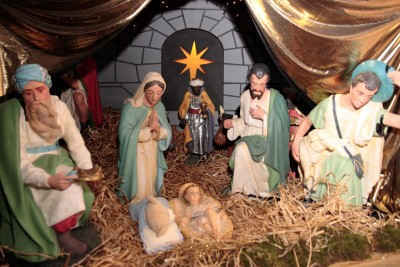 Briefly, historians say the birth of Jesus occurred around 6 or 5 BC. The Bible tells us that Jesus was born in the “fullness of time” (Galatians 4:4-5). Jesus’ birth took place at the time in history God chose. He had promised humanity a Savior in Genesis (3:15); and then set about to prepare humanity for the Savior’s arrival. God’s providence had arranged everything to culminate in the birth of the Savior in that stable on that night. The birth of the One who would give His life to pay for our sins. Luke 1:26-38 tells us the story of the angel Gabriel’s visit to Mary. This must have been quite unnerving for Mary, a visit from a heavenly being telling her that she, a virgin, has been chosen to give birth to the Savior of the world. Mary was initially frightened until Gabriel told her that she had found favor with God. Gabriel explained to her that she would conceive a child by the power of the Holy Spirit. Believers rightly celebrate Jesus’ birth, but it was actually a normal birth; if being born in a stable can be called normal, that is. However, His conception was a one-time event that was unique in all of history. He will be called Holy-the Son of God (1:35). Gabriel assured Mary these things would surely take place because, “…nothing will be impossible with God” (1:37 ESV). Mary and the angel ended their conversation with Mary humbling herself to the will of God. Most believe that place was a stable, because the Bible says the baby Jesus was placed in a manger, which is a feeding trough for animals, at His birth. At this time, Joseph and Mary were engaged to be married. In their culture, when a man and woman were engaged it was very much as if they were married, only without sexual relations. When Joseph found out that Mary was pregnant, he decided that he should divorce her without any publicity. Joseph was probably very confused about the situation. He believed he was marrying a virgin, and now he discovers that she is pregnant. People would think that Mary had been unfaithful to her spouse already. Still Joseph could have made a public spectacle of Mary, disgrace her publicly in order to preserve his pride. However, apparently, Joseph was a better man and decided to divorce Mary quietly. However, God had other plans for Joseph. In Matthew 1:18-25, an angel appeared to Joseph in a dream reassuring him that Mary’s pregnancy was a gift from God and that Joseph should not be afraid to take Mary as his wife. Once again, the angel included in its message that the baby’s name was to be “…Jesus, for he will save his people form their sins” (1:21 ESV). The name ‘Jesus’ is the Greek form of a Hebrew word meaning “Jehovah [God] will save”. Even the name God gave Jesus testified to His mission in life. Believing the Word from God, Joseph took Mary as his wife. Caesar Augustus called for a census to be taken of all those dwelling in his realm. Joseph and Mary lived in Nazareth, but were required by the Roman government to make the trip to Bethlehem in order to register in the census. The census was taken in order to assess the population for tax purposes. Thus, Jesus was born in Bethlehem, even though his parents’ home was in Nazareth. This fulfilled the prophecy of His birth found in Micah 5:2. Since this was the time of the census, the city of Bethlehem would be brimming with out-of-towners. For whatever reason, Joseph and Mary could find no suitable accommodations. Then, the time came for Jesus to be born. Apparently, Joseph and Mary searched for some place that she could deliver a baby in relative privacy. Most believe that place was a stable, because the Bible says the baby Jesus was placed in a manger, which is a feeding trough for animals, at His birth. I am purposefully avoiding too much theological pondering in this article. I want to focus on what it would have been like that night with Joseph and Mary. They had traveled roughly 70 miles from their hometown in order to participate in this census. However, that was just what was taking place on the outside. Their spirits must have been soaring, knowing what the angels had told them, knowing the time was near for Mary to give birth to God’s Son, knowing that they had been chosen to participate in this incredible plan of God’s to save mankind from sin. The hardships of the journey, and their lack of better accommodations, could hardly have made a dent in the overwhelming joy they must have been experiencing. It just seems reasonable that a loving God would bless their experience in a most powerful way. This was God coming into the world in human flesh. I cannot help picture the entire event as something blessed by God in a way that is unique to that particular time and place. What an incredible story. Truly, the greatest story ever told. The Christmas story of Jesus’ birth has always been special to me. The warmth I feel in my heart at Christmas time is more than the hot chocolate, or the Christmas tree lights at night, or any of the other fond memories I have of the holiday season. It feels like God spreads His love on humanity a little thicker during the Christmas season. It is as if He is reminding us that the gift of His Son, that He gave us so many years ago, should convince us of His love for us. A love that we should all seek to emulate and share with others. Christmas should be a celebration of the birth of the Savior. It is my prayer that, this Christmas season, Christians will lovingly and prayerfully take the lead in turning the holidays back into a time of reflection on, and worship of, Jesus Christ. “Therefore he had to be made like his brothers in every respect, so that he might become a merciful and faithful high priest in the service of God, to make propitiation for the sins of the people” (Hebrews 2:17 ESV). Robert, you are such a blessing and your humility is so much like Moses’. There has been no greater birth notice that has ever happened in all of human history and humanity will never be the same. I am amazed at your skill and knowledge of the Bible and there is always something that I truly learn from you. Your biblical education and theological knowledge is second to none here and for which I am truly thankful and I thank God FOR you brother. Thank you for your comments. You are too kind. I am certainly no saint (just ask my wife), but this article virtually wrote itself. It was such a joy to immerse myself in the Christmas story (as I try to do every year around this time). I only pray that some are brought closer to Christ through what I have written. Thank you once again, brother. It is such a blessing to be used of God. I am humbled and honored that the skill He gave me has been a blessing to you. To me, this is the most beautiful story in the Bible. It took Christmas for Easter to be a reality. God bless you. What a wonderful article, Robert. This is one I will try to read and reflect on several times this next month. This is a story that never gets old! Thank you very much. As I told Jack, this article seemed to write itself. It was such a joy to be involved. I was blessed several times while putting it together. I mean, with a topic like the birth of Jesus, how could it not be special time. God bless you, Josh. Dear Sir, I note that you say that Jesus was born in a stable, may I respectfully inform you the bible does NOT use the word stable, it speaks of a manger, but not a stable, and if so could you please inform me where it is found in holy scripture. Yours in Christ, Ronnie Douglas. Thank you for reading and commenting. The Merriam/Webster online dictionary has this definition for the word “manger”: “a trough or open box in a stable designed to hold feed or fodder for livestock”. Therefore, indicating that Mary and Joseph were in a stable at the time of Jesus’ birth. Is there a reason for your concern?God bless you Ronnie. Christmas is a pagan holiday.. Jesus was not born on December 25th, but in September. Read and research. It was the rainy season there in December and all shepherds had no flocks in the fields at that time in the cold wet season. He was concieved in December. People, look and research. No where in the bible does it say any thing of December. While the word “Christmas” and the actual date of Jesus’ birth is not provided for us in the Bible, the fact remains that the Nativity is in the Bible and as Christians, we can and should celebrate the Nativity for what it is … the birth of our Savior and Lord Jesus the Christ for without this miracle we would be stuck in sin on our way to Hell.